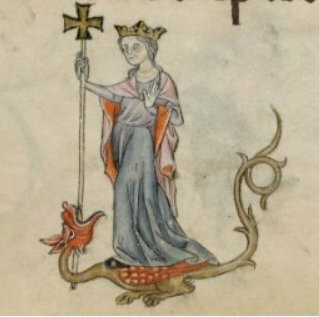 Female figure in London, British Library, Luttrell Psalter, c. 1320-1340, fol. 37r. If you choose this image, you should focus on the female figure at the bottom of folio 37r of the Luttrell Psalter, which was made in England c. 1320-1340. 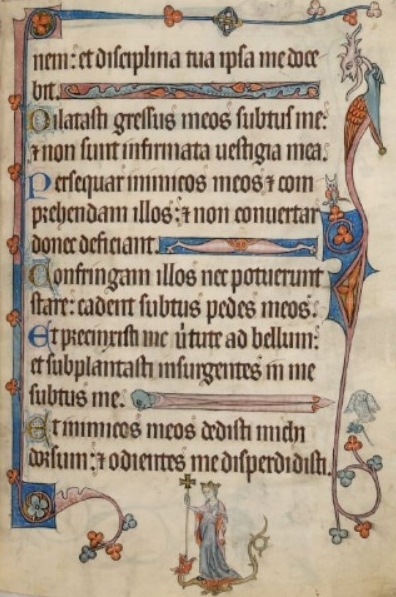 You should also consider the figure in relation to the text on the full page of the manuscript, as well as the monstrous figures in the margins (see image below on right). and my feet are not weakened. stare; cadent subtus pedes meos. to stand; they shall fall under my feet. dorsum, et odientes me disperdidisti. and hast destroyed them that hated me.